Go to any beauty counter and you’ll see rows of skincare products featuring plant-based extracts. Most of them work to moisturize, cleanse, tone, heal, and to anti-age. 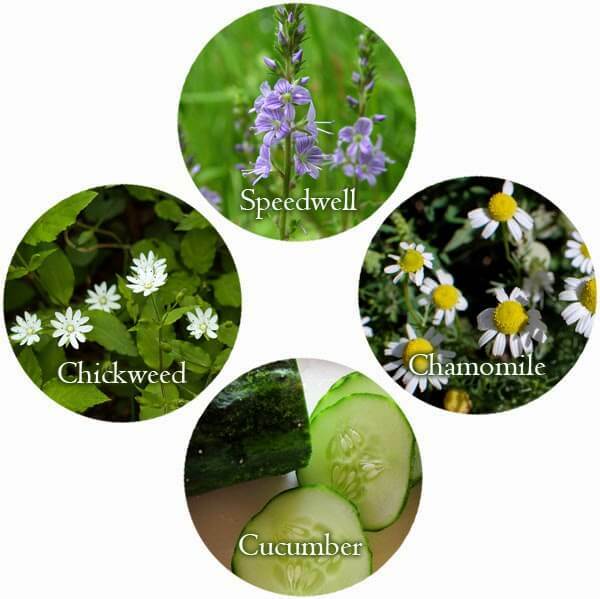 While some sound exotic, other herbs for natural skincare can be grown in your very own skincare garden. The beauty industry likes to create a certain mystique about ‘botanical extracts’. In reality, it’s fairly easy to grow, process, and create your own beauty products using homegrown herbs. 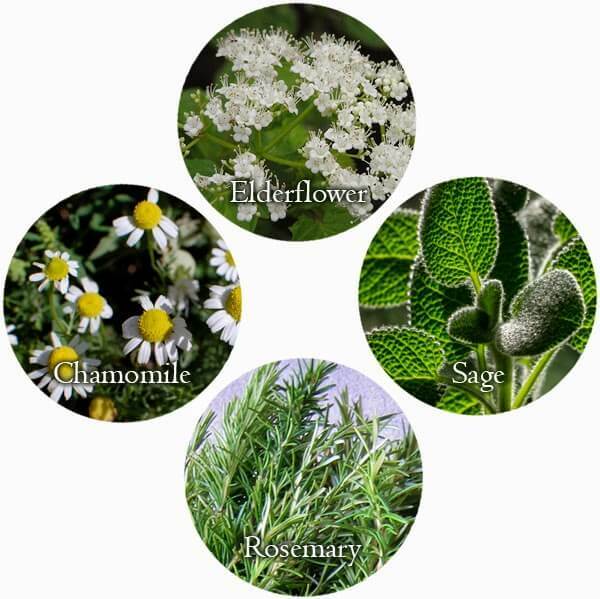 This piece focuses on showing which herbs are best for different types of skin. The second piece in the series presents how to extract the beneficial properties from fresh and dried plant material. There are scores of plants you can use to form your handmade beauty arsenal. Some plants are great at soothing irritated skin, others moisturize, and yet others treat acne. I’ve categorised the below skincare plants based on their main uses. These include Healing, Astringent/Toning, and Moisturizing. 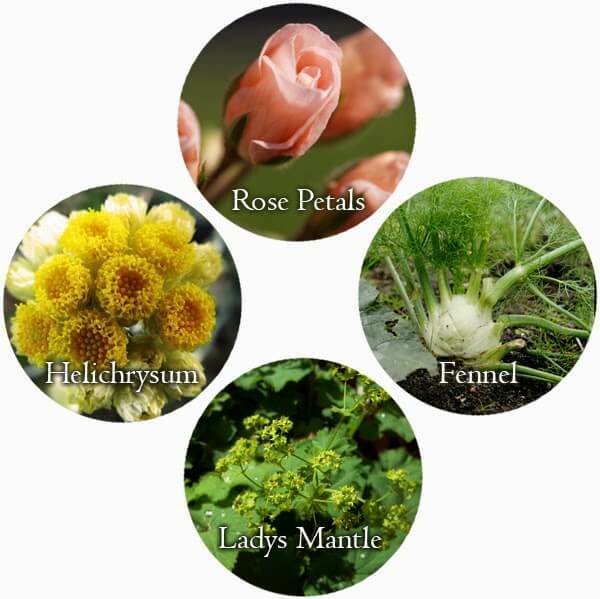 I’ve also included herbs that are great for Mature skin, Acne, Lightening/Darkening, and soothing Inflammation. 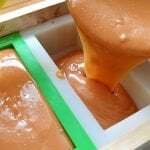 The main extracting method you use for each of the plant is listed in the description. Possible uses and beauty products you can make with the botanical are presented too. Calendula (Calendula Officinalis). Extracts from the golden petals of this flower soothe the skin, reduce inflammation, and heal burns, sunburns, acne, eczema, and skin abrasions. Use the oil or water infusion method for extraction. Possible uses include balms, creams, lotions, toners, and rinses. You can also make a tincture from Calendula which can be dabbed onto pimples to promote healing. Aloe Vera (Aloe barbadensis). If your climate is not warm enough to grow aloe vera outdoors, it does well in pots. The gel inside its leaves is used to soothe burned skin and to reduce inflammation. Aloe can also be used as an oil-free moisturizer though regular use can over-dry your skin. Extract by cutting the leaves open and scooping out the gel. Aloe can be used on its own but also in creams and lotions. Echinacea (Echinacea purpurea). 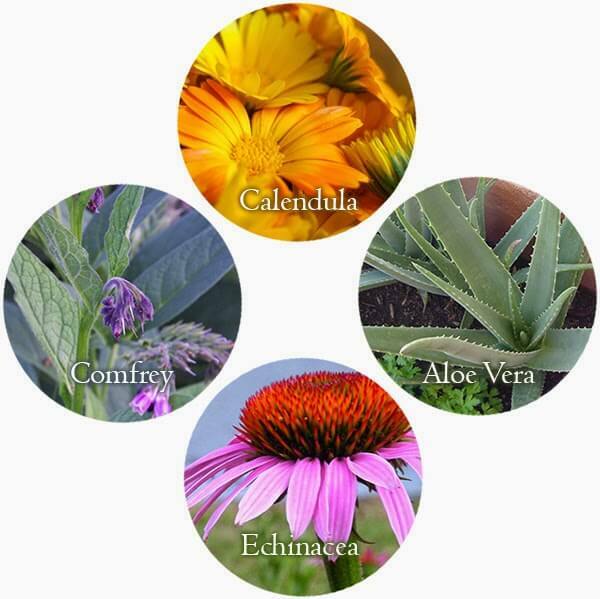 Echinacea extract can help speed up skin regeneration, reduce inflammation, and treat acne. It’s also a gorgeous flower that would look beautiful in any garden. Use a decoction of the roots or infusion of the flowers as a toner or to drink, or to make creams and lotions. Comfrey (Symphytum offinale). An oil infusion made from the leaves is soothing and healing and can be used to treat Acne and Psoriasis. A tincture made from the roots can be used directly on Acne and will help clear it up. The leaves and flowers of this plant also have powerful anti-inflammatory properties. 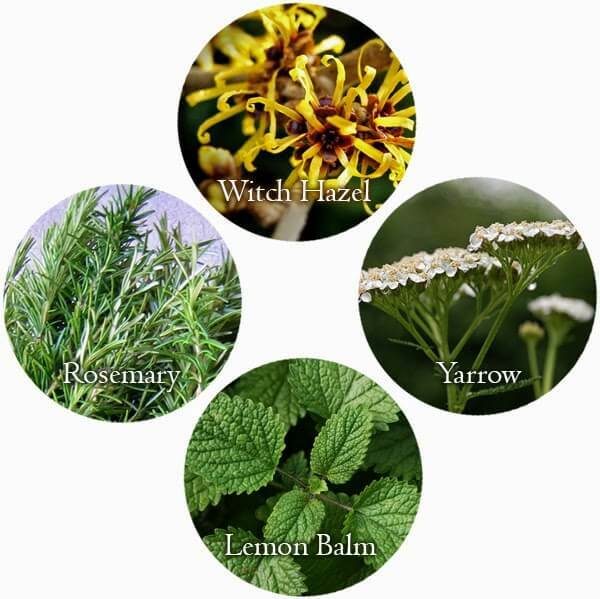 An infusion can be made from these parts for use as a toner or in creams and lotions. Growing tip: Comfrey can be a bit of a pest in the garden due to its tendency to self-seed. Fortunately there is a sterile variety available called Bocking 14. Green Tea (Camellia sinensis). This might seem like an exotic plant but Green Tea can easily be grown in temperate zones. Requiring a sunny spot in slightly acidic soil, green tea leaves can be grown for both consumption and beauty products. While Green Tea is most known for its antioxidant’s ability to improve the condition of aging skin, these same antioxidants have been shown to control sebum (oil) production, inhibit bacterial growth, and reduce inflammation. Make an infusion of the fresh or dried tea leaves and use in creams, lotions, or as a facial toner. Lavender (Lavandula angustifolia). 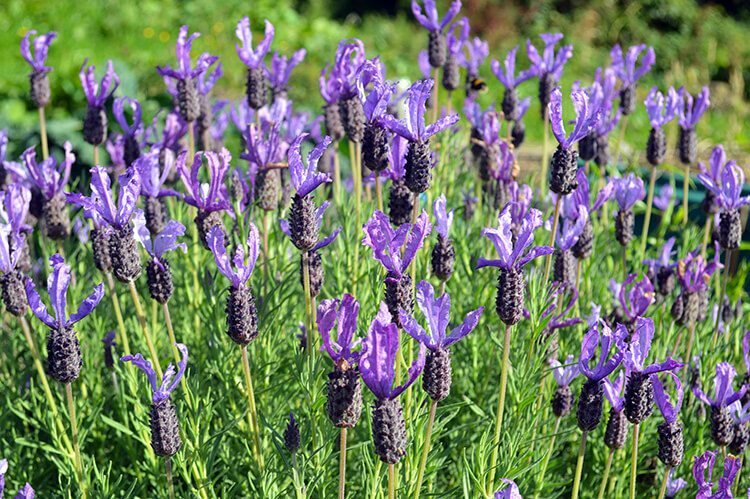 A common and fragrant garden shrub, Lavender has antiseptic and anti-inflammatory properties. This makes it beneficial for those with skin irritation and inflammation. Lavender oil has also been shown to help speed the healing of cuts, burns, and abrasions. Use fresh or dried flowers to make an infusion and use in creams, lotions, or as a facial toner. 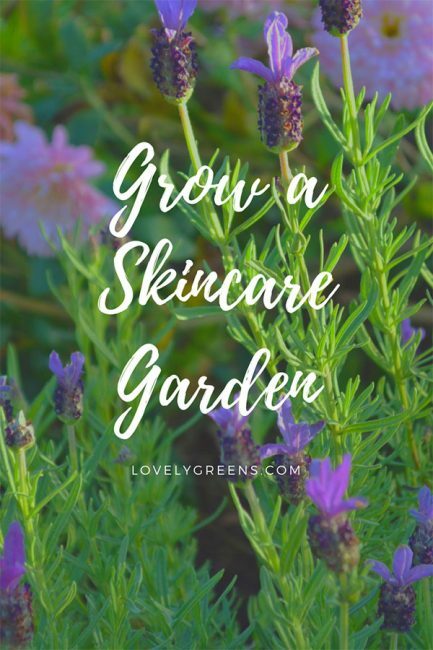 Here’s how to grow lavender for skincare recipes. Burdock Root (Arctium lappa). 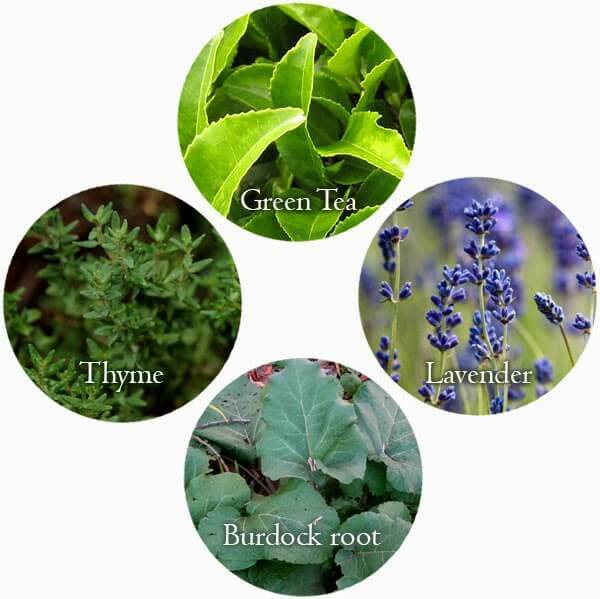 While the other herbs in this list are meant to be used topically, Burdock root should mainly be taken internally. Burdock is a cleansing herb and works from the inside to help heal acne, boils, psoriasis, and eczema. Drink a decoction of the root daily for up to a month. Thyme (Thymus vulgaris). Recent studies have shown that Thyme is more effective at clearing acne than treatments using Benzoyl Peroxide. Scientists used a tincture (herb infused in alcohol) to conduct the study but if you’d like to use a less drying medium, try infusing thyme in witch hazel. * Both Calendula and Comfrey which are listed in the ‘Healing’ section are both excellent for treating Acne. Roses (Rosa). Rose Water is a mild astringent and toner that is excellent for all skin types but especially mature skin. It helps cleanse and tone while boosting regeneration and moisture levels. Make your own ‘Rose Water’ using this infusion method. Both wild and cultivated rose petals are suitable. Green Tea (Camellia sinensis). Green Tea has been shown to help repair skin damaged by age and environmental factors. Drink as a tea or use the infusion as a toner or in creams and lotions. Ladys Mantle (Alchemilla vulgaris). Found in anti-wrinkle creams, Ladys Mantle helps firm the skin and decrease the size of pores. Use an infusion of the leaves as a toner or in creams and lotions. Helichrysum (Helichrysum italicum). An effective botanical for skin conditions ranging from acne to aged and damaged skin, Helichrysum has natural anti-inflammatory properties that reduce redness and promote regeneration. Use an infusion of the flowers to help diminish fine lines and wrinkles. The infusion can be used on its own as a toner, or in creams and lotions. Witch Hazel (Hamamelis). Used in many commercial toners, Witch Hazel contains naturally high levels of astringent tannins. These help to remove oil and tighten the skin. Use an infusion of the leaves as a natural toner. Yarrow (Achillea millefolium). Every garden has ‘weeds’ but some are more useful than others. In a skincare garden you might want to encourage Yarrow, a common wild plant used in herbal medicine. An infusion of the leaves and flowers can be used as an astringent toner, helping remove oil, improve skin tone, and reduce inflammation. Lemon Balm (Melissa officinalis). A lemony and minty plant that works as a refreshing toner for oily and acne-prone skin. Use an infusion of the leaves as a toner or for use in creams and lotions. Rosemary (Rosmarinus officinalis). An infusion of Rosemary leaves can be used as an aromatic astringent for all skin types. It also helps in promoting healing by stimulating blood flow to the skin. Use an oil or water infusion of this herb in making massage oils, toners, creams, hair rinses, balms, and lotions. Violet (Viola odorata or Viola canina). Fragrant and only slightly astringent, violet leaf and flower extract is juicy and moisturising. 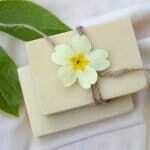 Perfect for dry skin, Violets are also anti-inflammatory and help heal cuts and wounds. Infuse fresh plant material in oil or water and use the extract to make creams, lotions, balms, massage oil, and toners. Common Plantain (Plantago major or Plantago lanceolata). Another ‘weed’ that you’ll find happily growing in most gardens, plantain leaves contain moisturizing mucilage. It’s also an effective skin healer and can be used in the same way as comfrey to help heal wounds and bruises. Prepare the leaves by water or oil infusion for use in creams, lotions, balms, and massage oils. Roses (Rosa). 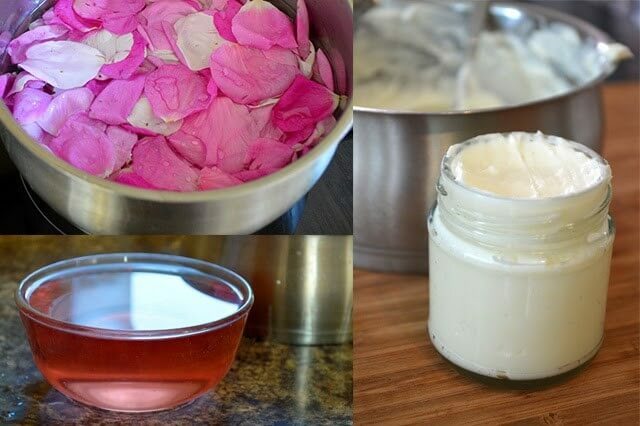 An infusion of rose petals used as a skin spritzer or in lotions helps moisturize the skin. Roses are an excellent extract for all skin types but especially for those with sensitive and mature skin. Make your own rose infusion using this method. Marsh Mallow (Althaea officinalis). Though found growing in the wild, Marsh Mallow can also be grown in your skincare garden. It’s a plant set best at the back of your borders since the flower spike can grow up to seven feet tall! The roots. leaves, and flowers of Marsh Mallow contain rich sources of mucilage, pectin, and sugars that soften and moisturize the skin. Infusions from this plant create a silky texture in creams and lotions. Elderflower (Sambucus). The flowers of this wild tree blossom in late May through June and are used in making sweet cordials, wine, and desserts. Lesser known is that infusions of the flowers can be used to help fade freckles, age spots, and scars. The extract is also anti-inflammatory and can help condition mature skin. Sage (Salvia officinalis). Although this herb helps to cleanse oily skin, you can also use it as a rinse for dark hair. Infuse the fresh or dried leaves in water and apply to hair daily. Though it wont permanently tint your hair like chemical dyes, it can gradually darken hair. Grey or coarse hair may be resistant to picking up colour though. Tip: use in combination with rosemary, crushed black walnut hulls, nettles, and coffee for increased darkening effects. Rosemary (Rosmarinus officinalis). Rosemary can be used similarly to Sage (see above) in helping to darken hair. Use as a water infusion as a rinse for the hair. German Chamomile (Matricaria recutita). 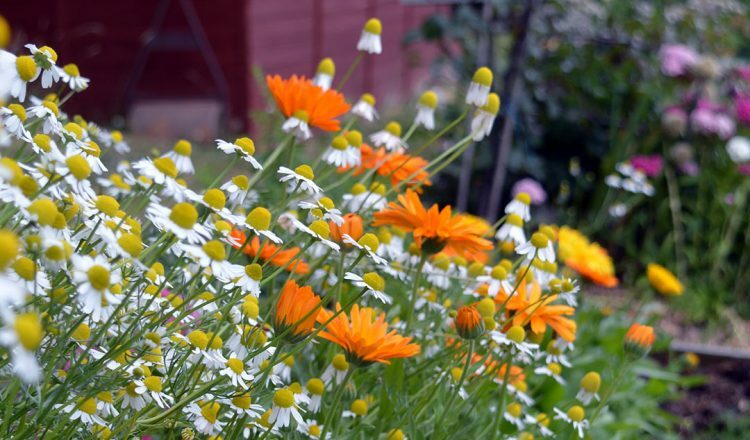 Chamomile is a calming and healing herb that can be used for both skin and hair. In hair care, Chamomile is a natural lightener. Use a water infusions of the flowers as a hair rinse or in leave in conditioners. If you want to increase the lightening power of Chamomile, use it together with a small amount of lemon juice. Speedwell (Veronica chamaedrys). An anti-inflammatory flower used to relieve the redness and itch caused by eczema and other skin conditions. It grows wild throughout Britain but makes a lovely addition to any garden. Use an infusion of the leaves and flowers as a toner or in creams and lotions. German Chamomile (Matricaria recutita). A gentle herb, it’s used to soothe dry and irritated skin such as caused by dermatitis and eczema. However the extracts of Chamomile can be used to calm all skin types and a tea made from the flowers is a mild sedative when taken internally. Use oil or water infusions in balms, creams, lotions, toners, or massage oil. Cucumber (Cucumis sativus). 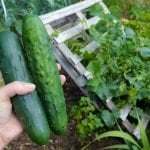 A common garden vegetable, the moist flesh of cucumbers can be used to reduce puffiness, soothe irritation, and tighten the skin. Use a water infusion of cucumber in creams and lotions, puree the flesh and use it as a facial mask, or use the well known treatment of slices of cucumber over the eyes to soothe, tighten, and lighten dark circles. Chickweed (Stellaria media). A very common weed in many gardens, Chickweed can be eaten in salads, or given to your hens as a treat – this plant didn’t get its name for nothing! 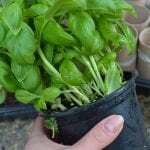 Chickweed is also an effective anti-inflammatory that when infused in water or oil can be made into balms, salves, creams, lotions, and other beauty products. It’s said to reduce redness and irritation and to soothe chronic itching. If you liked this piece, please continue to the second part of this series on how to extract the beneficial properties from your homegrown herbs and flowers. Your website has SO much well written educational content. My head is spinning with ideas. Thanks so much for sharing your knowledge. 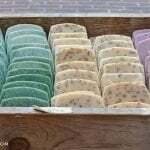 I made my first batch of lavender & rosemary lotion bars (incorporating herbs from my garden) & I am hooked. I can’t wait to grow more herbs you have suggested, make my own infused oils and make some soap! Thank you, thank you! I’m so happy that you’re finding so much inspiration here on Lovely Greens! Glad to have you on board Kate and please feel free to subscribe to my weekly newsletter — there’s a link in the top navigation. I share seasonal ideas and anything new! 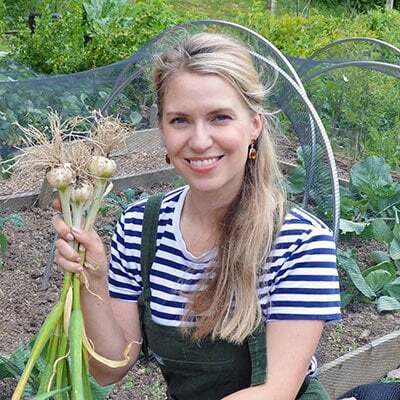 I love the idea of growing your own skincare! Sharing to my Facebook and my Pinterest board. Thanks again. 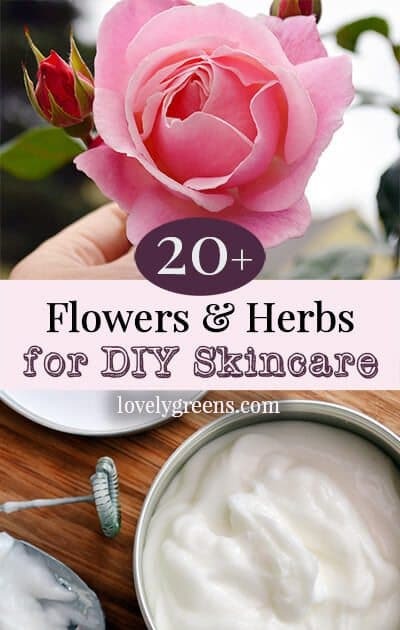 are you able to recommend a certain type of rose to grow that have skin care benefits; I see different types of roses in ingredients but wonder if one type is better than another. Thank you. Any old variety rose will do but if you’re interested, Rosa × damascena is the type used for essential oil extraction. Very helpful article. However whats the easiest way to infuse all of these products to put into cream, candle? What rose plant variety is best? 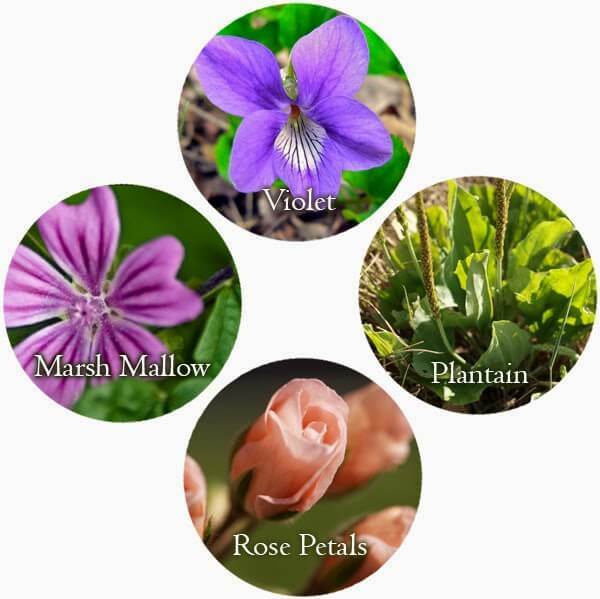 Older varieties and wild roses have more fragrance than newer types. I’d stick with those if given a choice. 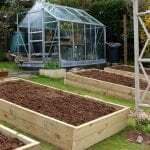 There’s such a wide range of home grown plants which can be used to improve health and beauty. Not many people are aware of this! Thanks for sharing! I am not trying to scare anyone, just to be sure that the information is available to them. Thanks Pamela for your caution 🙂 Fortunately, the majority of people won't have an issue with using Chamomile or Echinacea. Tanya, this was a recent discovery for me. My older son has some fairly severe environmental allergies (weeds and grasses) which affect his skin. Our MD did confirm that chamomile and ragweed are related; fortunately I myself am not allergic and can use chamomile products and drink chamomile tea. It is a wonderful herb for many purposes. I want to add that I love your site and the information you have on it. It is always so well-written and beautifully illustrated.